The weather for the July 4 holiday this year was cool with intermittent rainshowers, but I decided to hike to Redpine Lake. The last time I was at Redpine was almost exactly five months ago – see post on snowshoeing from February 3 of this year. 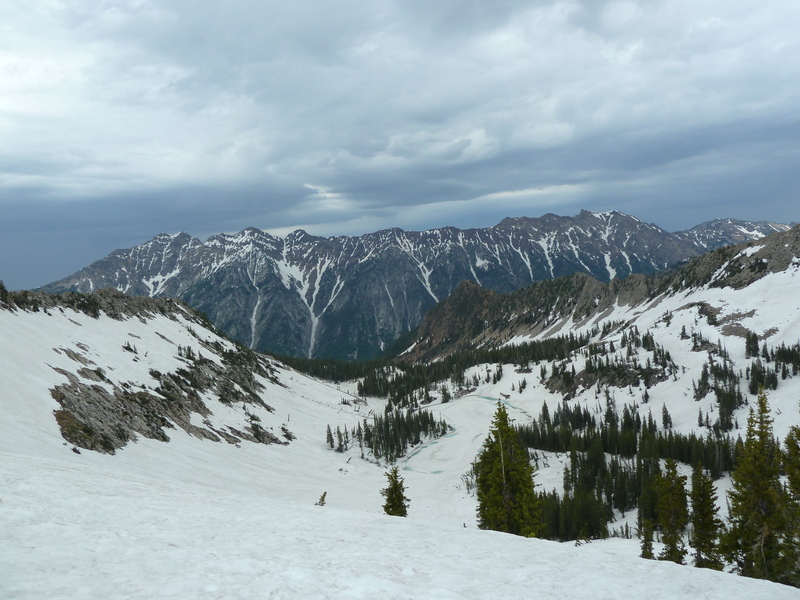 On July 4 this year, the lake was still entirely frozen over and there were plenty of backcountry skiers and snowshoers enjoying the July 4 snow above about 9,000 feet. I had the idea to at least hike to the lake and perhaps to Pfeifferhorn. I had not been up Big or Little Cottonwood Canyons since the end of ski season this year and I knew there was a massive amount of snow since people were still skiing up the road at Snowbird. I came well prepared with my ice axe and cold weather clothing. I planned at least to do some glissading on the slopes above the lake. I reached lower Redpine Lake early enough in the day and decided to climb all the way to the ridge connecting the Redpine basin to Pfeifferhorn. The amount of snow remaining on the slopes and ridges was surprising. I have never seen so much snow at such relatively low elevations. The conditions were similar to those seen in late April or May – not July. 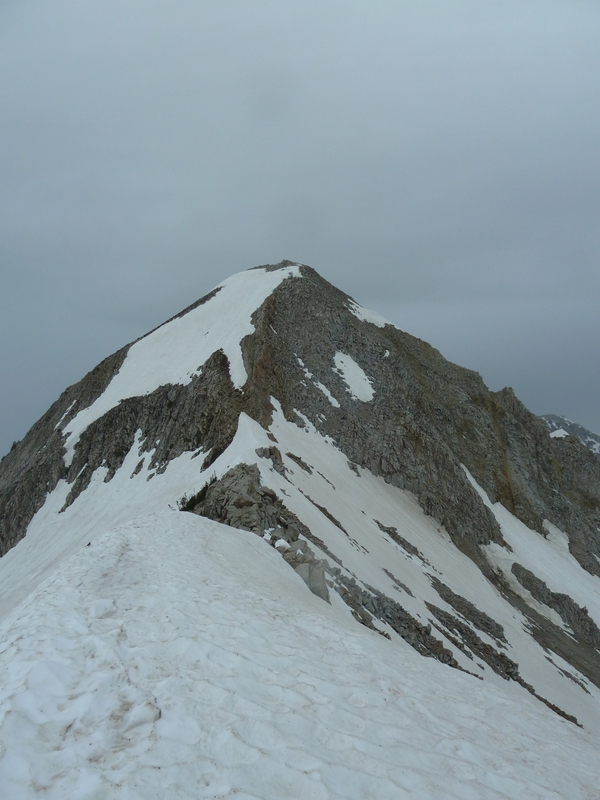 Once I got high enough on the ridge I finally had a good view of Pfeifferhorn. The ridge and the climb up was completely choked with snow. It had also begun to rain and sleet on the ridge and I decided that it was perhaps not the best day for an attempt at the peak. So I enjoyed the views of Utah Lake, Mt. Timpanogos and back down to the valley to the north side of Little Cottonwood Canyon. The views were stunning and I had a good view of the upper basins on the southwest-facing side of the Wasatch above Draper, Utah. A funny thing happened to me on the way back down from the ridge to the lake. I had my ice axe in hand the whole way up the snow slope in case of a slip or a mis-step. As I traversed ed the upper slope coming down from the ridge over the lake using a track of footsteps set in the snow, I looked down. I suddenly froze, panicking that I might slip in fall. It took me several minutes standing on the slope to convince myself that even if I did slip, I had my ice axe ready for a self arrest. Further, the wet summer snow would probably not allow me to slip very far anyway. I made my way back down the slope after the panic subsided and actually had some fun glissading all the way back to lower Redpine Lake. The hike back down to the trailhead was uneventful except for the moose feeding on the willows in Little Cottonwood Creek. Unfortunately, I only got some very blurry photos of him – and I do say him since he had quite a head of moosey horns. This month’s adventure was to Great Basin National Park in eastern Nevada. 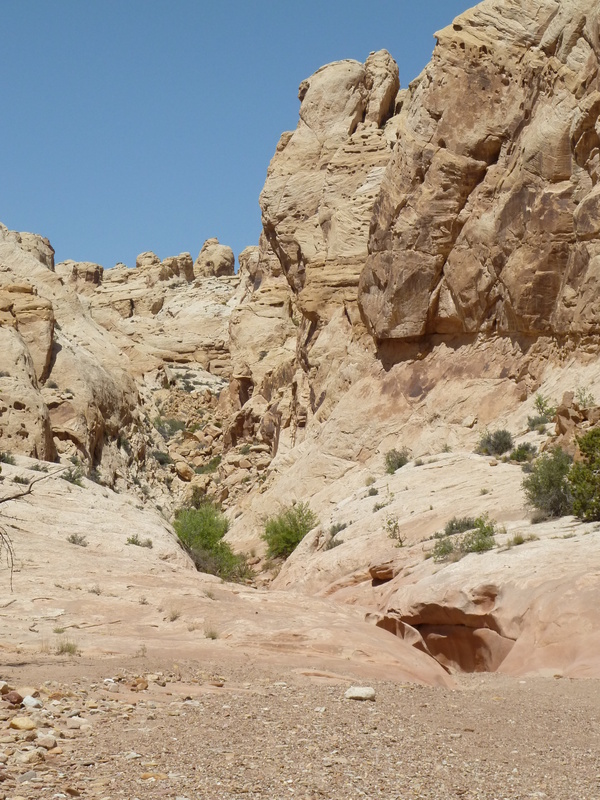 I had never spent much time in Nevada – other than a quick overnight in Las Vegas on the way to Death Valley back in January and driving a Uhaul truck from San Francisco to Salt Lake City after too much revelry at a friend’s wedding the day before. Thus my limited impressions of Nevada were of strip malls and hangovers. This past weekend cured me of those initial sickly impressions. 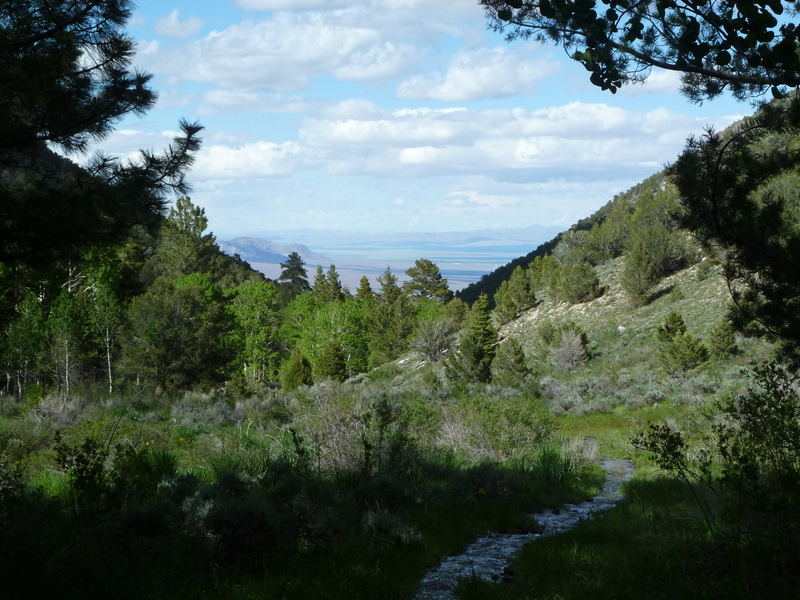 The park makes up most of the Snake Range and is the highest range in the Great Basin. Most of the trails and the developed portions of the park are all on the east side – facing Utah. 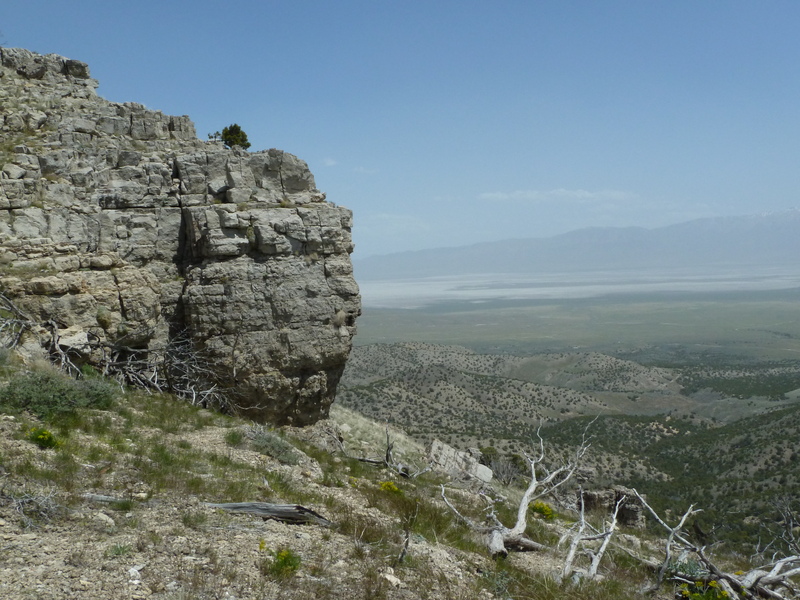 By virtue of this, it offers some amazing views of the successive ranges of the Utah portion of the Great Basin. The visitor center itself offers clear views of the Confusion Range and the House Range with prominent Notch Peak. Clearer days provide even more distant views. The park has received similar amounts of snow as Salt Lake City and the snowpack is around 200% of normal. I had wanted to climb Wheeler Peak, but with this much late season snow, it would have made for a very strenuous hike. We decided to stick to some lower altitude hikes for our three-day weekend. Upon arriving on Saturday we found a nice campsite in the Upper Lehman campground. Anyone who knows me well enough knows that I prefer to pack in to my campsites and generally I am not a fan of camping within view of one’s vehicle. Again, I was pleasantly surprised. Much of the campground space in the park is tent-only since it is impossible to get a heavy RV up the narrow park roads. There are toilets and running water, but the campsites themselves are secluded and still feel relatively primitive. On our first day we hiked the Osceola Ditch – a nineteenth century water project that was a system of sluices to ferry water to the north side of the range for placer mining. The project was unsuccessful and the town of Osceola flourished and died with minimal profit ever derived from the lode. I could comment here about the booms and busts of the West’s mineral wealth especially since just yesterday Interior Secretary Ken Salazar essentially announced an end to Uranium mining in the Arizona Strip citing concerns for water in the Colorado River. This announcement was of course met with the usual collective ‘harumph’ from the locals complaining about ‘environmentalists’ and jobs. Leaving aside the fact that there are few uranium mining jobs in the strip now, most of these mineral projects are big, expensive and return less in the longer term to the locals than a permanent national park. Most of the mining jobs fall to outsiders anyway and when the resource is collected, the jobs follow the ore. Such was the case with the town of Osceola. The ditch now provides a nice introduction to the park’s topography as the trail follows the old route of the sluices. Wheeler Peak and Mount Moriah are visible over the ridges and at this time of year and with this much snowfall the wildflowers are stunning. 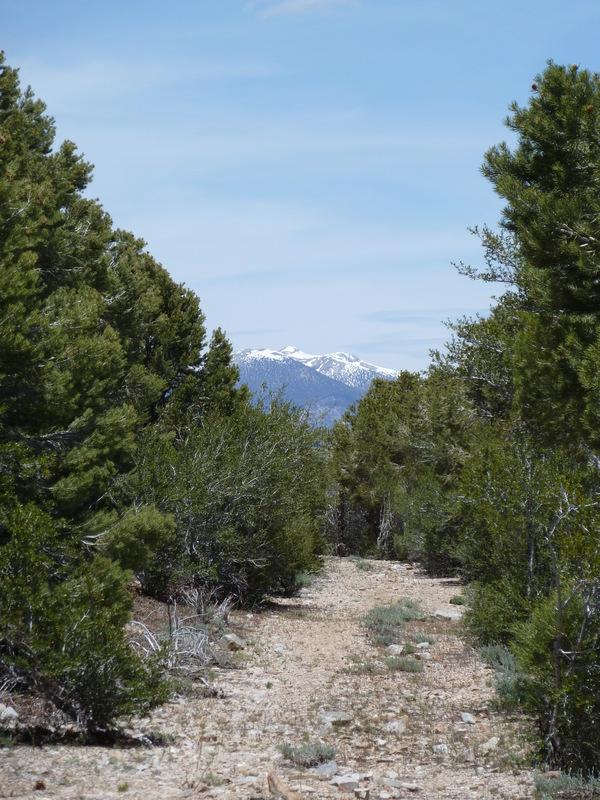 The trail follows a line on the range that is perfectly between the dry sagebrush flats of the basin and the aspen and pine groves of the range. The streams were all quite swollen with runoff as well. I also noticed a good variety of local songbirds. Our second day dawned with intermittent heavy rain – this is the very first time since I returned from abroad in the fall that I have camped and had to deal with rain of any sort. Of course when one plans trips to Southern Utah or Death Valley, one greatly increases their chances of having nice weather. We decided to take a tour of the Lehman Caves and wait to see if the weather would dry out a bit. Again, anyone who knows me better, knows that I do not often opt for the organized tour, and again, I was pleasantly surprised. The park staff were all very knowledgeable and I was very impressed with our tour guide for the caves. I learned that very recently seven (!) new species of cave dwellers have been discovered here and are unique to the caves in the Snake Range. These include a cave millipede and and several arachnids including pseudo-scorpions. The cave was rather mistreated by early visitors in the 19th and early 20th centuries, but the park now maintains much of it in a pristine state and offers tours of the parts that were degraded in the early period of the park when it was still a national monument for just the cave itself. I detected the new philosophy in park management of discussing earlier (mis)uses of resources and putting them in proper context. 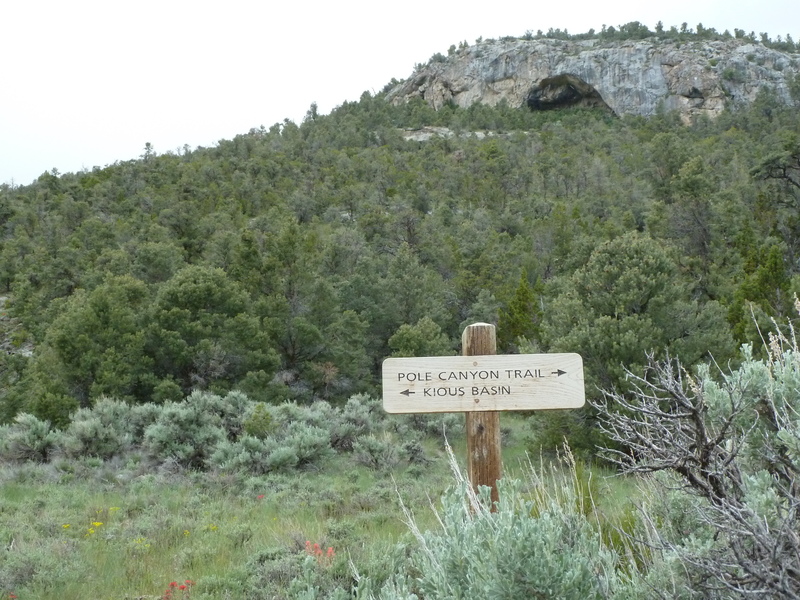 After lunch on Saturday we explored the Pole Canyon trail and hiked just to the Timber Creek cutoff. Reading both the very general and not-to-adequate navigation scale park map and the 1:100,000 map I had with me I saw that there was a trail that continued up the ridge to Johnson Lake. Once at the cutoff, I could find no trace of any other trail. We spent some time hiking a bit in the woods following illusive game trails but eventually gave up and headed back down the canyon. 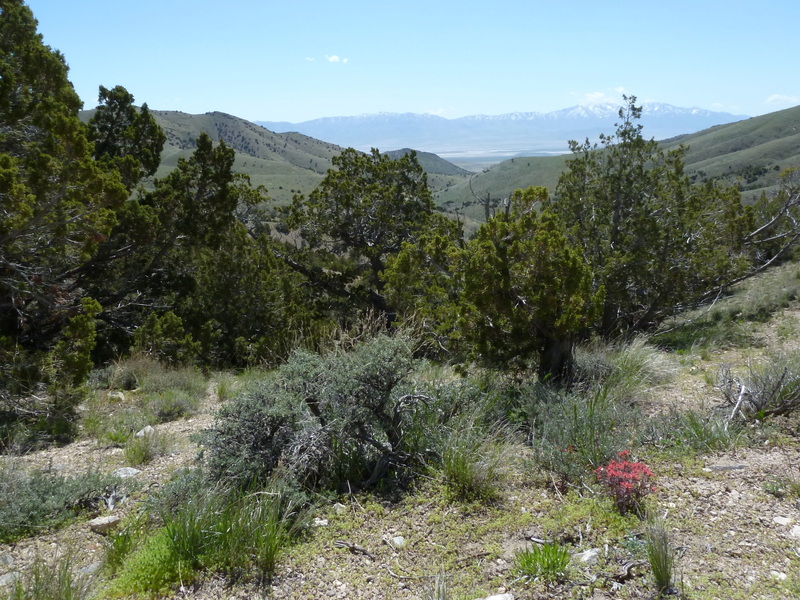 Again on this hike I was impressed with the variation between semi-arid sagebrush desert and alpine range. I have never seen such an interesting mix of aspen and sagebrush. 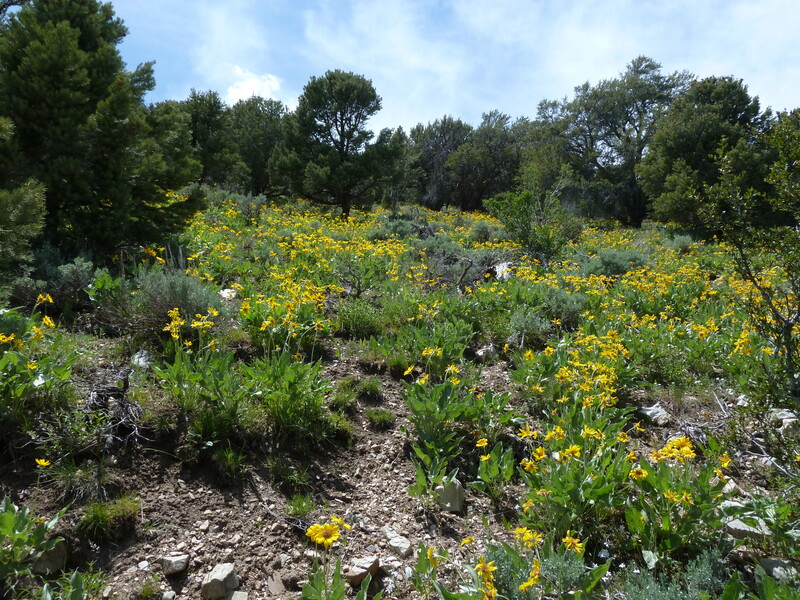 The June wildflowers were also impressive -a product of the massive winter snowfalls we have enjoyed. The highlight of the weekend was our hike to Johnson lake from the primitive campgrounds on the south end of the park. The hike starts at about 8,000 feet and climbs to 10,800 in about 3.6 miles. It crosses some of the same sagebrush and aspen areas then up into the more alpine zone. Once we reached about 9,500 feet we encountered deep snow and the last mile or so we had to cross the heavy remaining snowpack. Once in the basin of Johnson lake it was still full winter. The sky was a brilliant dark alpine blue and the lake and the surrounding peaks were still well hidden in snow. The ridges still have impressive cornices and there is evidence of several slides on the higher slopes – avalanche season is still active. 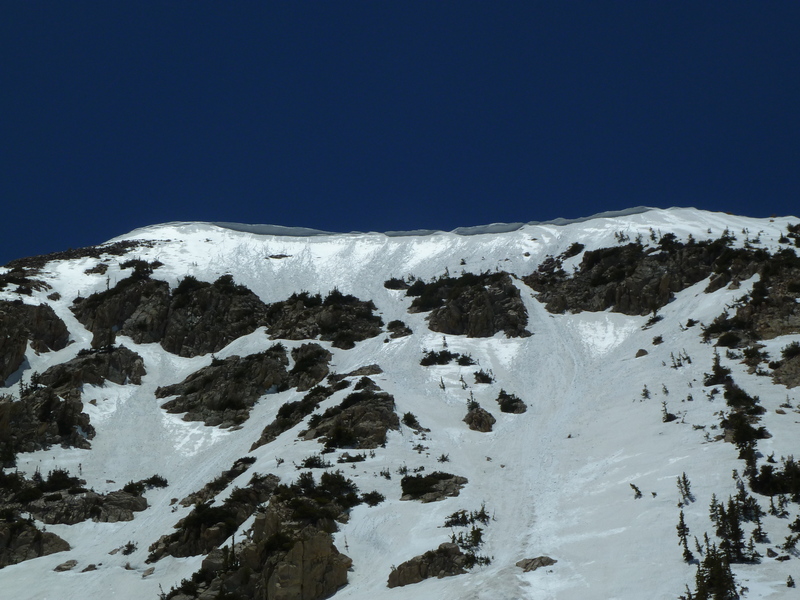 It is mostly wet avalanches at this point, but the amount of snow is impressive for the very last day of spring 2011. The most jaw-dropping aspect of this hike was the view to the east. We were rewarded with an expansive vista of the ranges marching eastward across the Great Basin in Utah. In the far distance almost ephemeral I could just make out some snow-capped peaks. 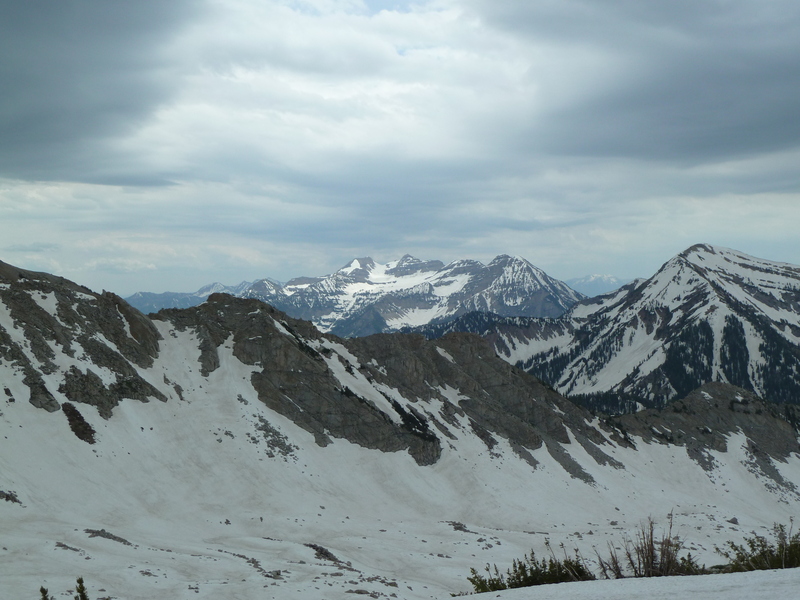 These, unbelievably, were the southern extent of the Wasatch Range. In the view from this high alpine lake then, one can see half of the Great Basin. If we could see through the ridge backing the lake, might we have been able to see all the way to the Sierras? This makes me eager to actually climb Wheeler Peak on a crystal clear day to find out. As with all of my adventures, I am now motivated to do more. The drive to the park goes right past Notch Peak in the House Range and I had recently read about it. It is a spectacular cliff face and the remote range should offer good prospects for future hikes. 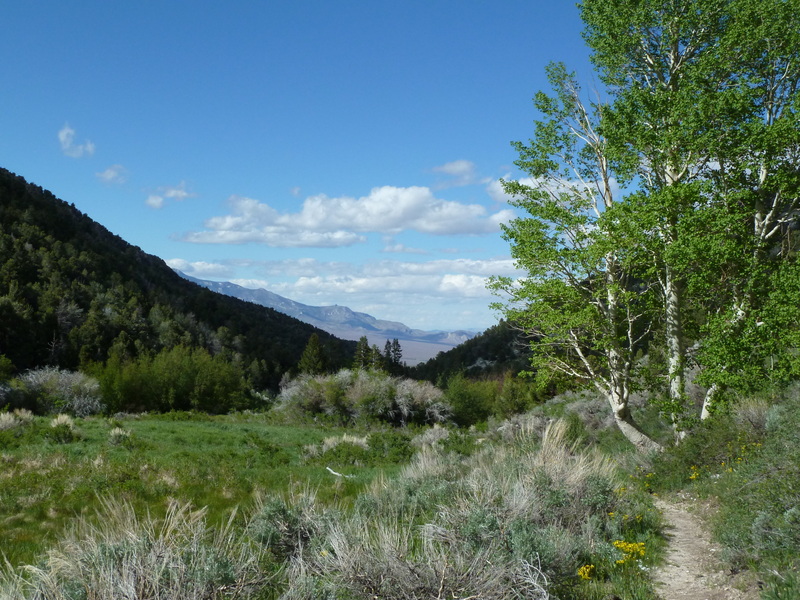 Even more, I am interested in exploring more of Nevada’s ranges and they seem to offer some unique backcountry experiences. They are unique islands rising out of the basin wastelands and I look forward to many more Nevada adventures free of strip malls, hangovers, and slow moving Uhaul trucks on the Interstate. Last Sunday, my new buddy Joseph and I drove the long and lonely road out to Fish Springs National Wildlife Refuge. The refuge surrounds a natural artesian spring that bubbles up in the middle of the desert creating a paradoxical lush wetland in the middle of the West Desert. I had not been so far down the old pony express road. 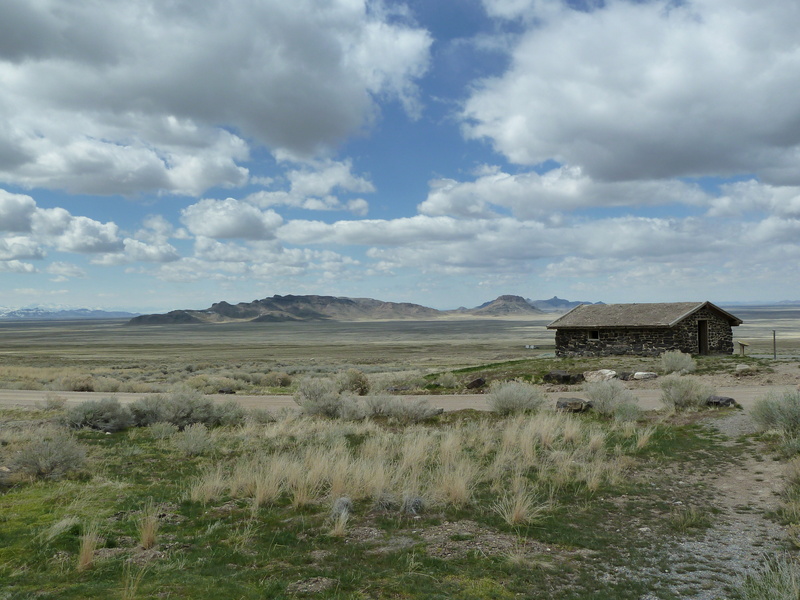 I tried back in April – see previous post here – but we only made it as far as the Simpson Springs Pony Express Cabin because the road was quite saturated with snowmelt. The road still has the fossilized remnants of our very wet spring. 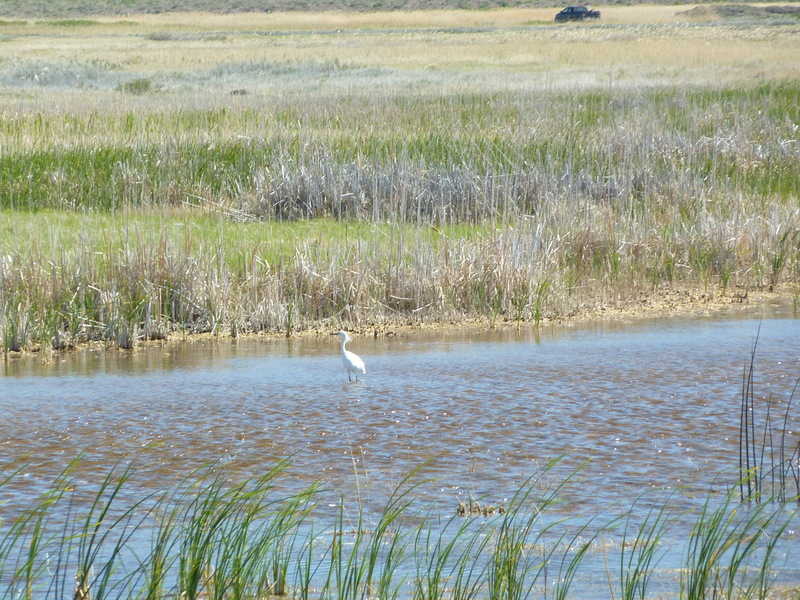 The refuge itself attracts a wide variety of migratory songbirds and waterfoul. Additionally, it also protects three species of fish – the least chub, the Utah chub and the speckled dace. There is also a large population of larger mammals including coyotes and antelope, we saw both loping through the reeds as we hiked. 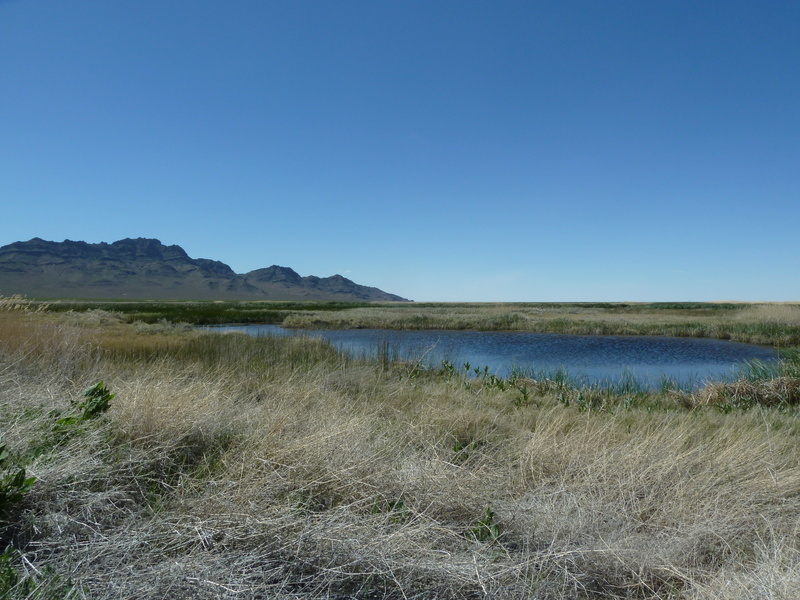 The water flows through the broad flat basin formed by the Fish Springs Range, the Dugway Range and the Drum Mountains; this is classic Great Basin topography with dry ranges rising from broad flats. The northern end of the refuge ends in a broad salt flat that marks the southern end of the Dugway Proving Ground. 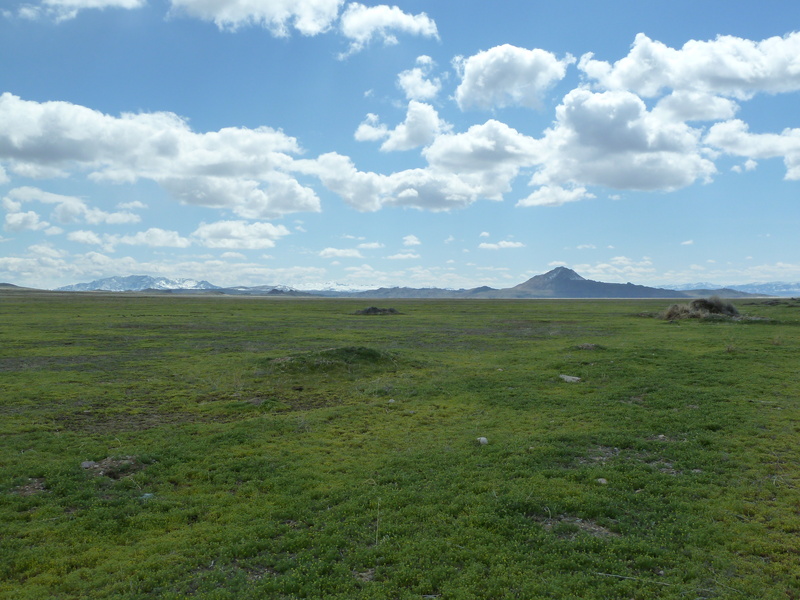 The area makes for pleasant hiking because it is flat and even this late in the spring, the temperature did not get much above 80°. 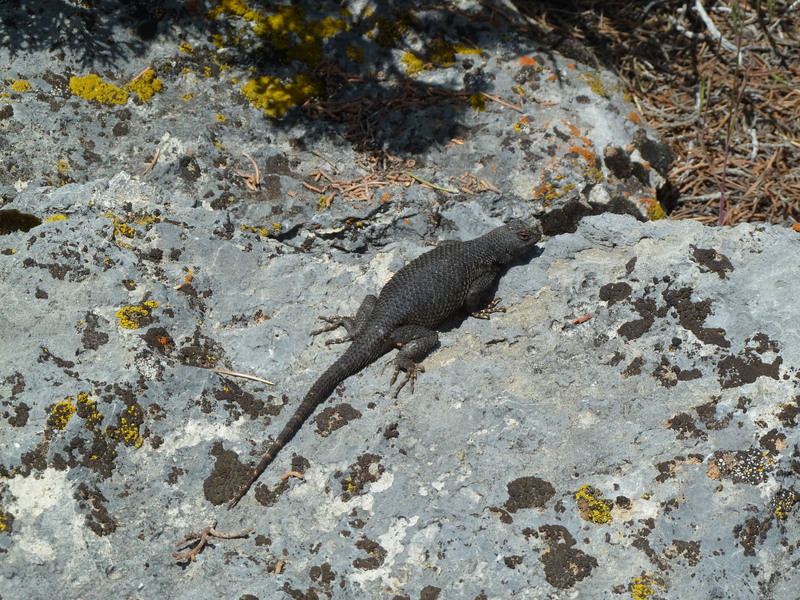 I did not expect to see much wildlife since we were hiking in the heat of the day and it is late in the migratory season. I was quite surprised to see as much birdlife as we did. 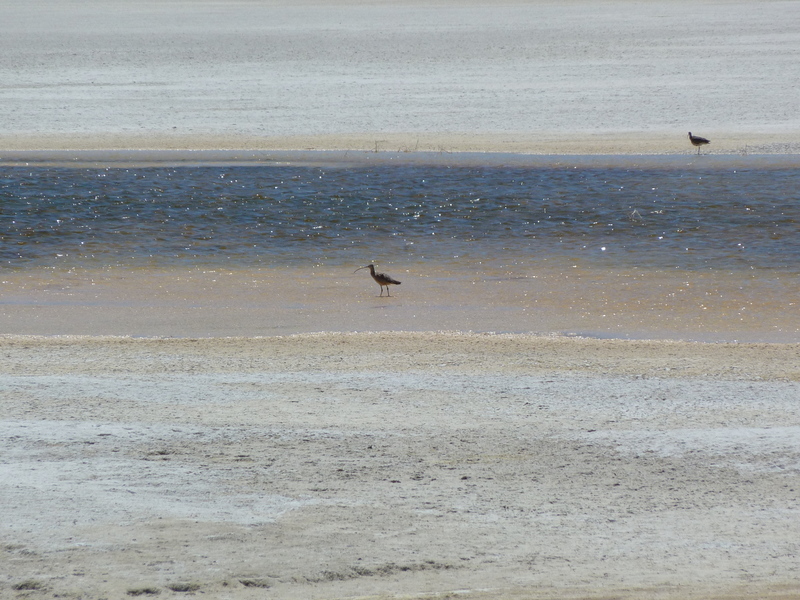 We noticed several avocets running in the flats and probing the sand for insects. There were also a few species of ducks, egrets, and geese. We also saw a killdeer couple doing a strutting mating dance. There were also the usual suspects who are always gathered in any flat grassy area in the west. My favorite of these is the western meadowlark whose call is my favorite. The trip out to Fish Springs reminds me how remote much of western Utah is. The entire expanse north of US 6 to I 80 is unsettled. There is some ranching that goes on, but there are not permanent settlements and very few roads. Services are also non-existent. I am using the opportunity of a mild spring and early summer to explore some of this region. The Great Basin offers some new landscapes for me to explore. I am far more used to the high alpine environments of the central Rockies or redrock canyon country of western Colorado and southern Utah. It is amazing that a large expanse of this continent is dominated by the repetitive landscape of the Great Basin. The continental undulation writhes from here in Salt Lake City all the way to the far side of Death Valley. The ranges around Fish Springs do not appear all that different from the ones I saw back in January in Death Valley. It is almost impossible to imagine the great inland seas that once filled all of these valleys. The last remnants of these massive waters remain in places like Fish Springs, or Great Salt Lake itself. We live in this valley only by the luck of good timing and geology. In the longer history the remaining waters will either dry up or increase to once again flood the valleys. I went back to the Cedar Mountain Range in the West Desert this past weekend. For some reason I am drawn to this range because of its utter desolation. The only road through the range slices through the northern head of the range. This road is known as Hastings Cutoff and goes over the appropriately named Hastings Pass in the Cedar Mountain Range. The Cutoff was a shortcut on the California trail that moved came from Echo Canyon just over what is now the Utah-Wyoming border and cuts south of Great Salt Lake rather than taking the longer northern route. Interestingly, the transcontinental railroad originally took the northern route, perhaps because of the difficulty at the Cedar Mountain Range. The range is now a designated wilderness area for perhaps a related reason: its designation blocked the eventual development of a nuclear waste facility that would have utilized the railroad that now runs along the route of Hastings Cutoff*. For my audience of one reader who lives outside of the Salt Lake Valley, this past Sunday was incredibly windy. So hiking the spine of the Range was a little challenging. It was not dangerous, but I did feel like I had done some heavy lifting or had been in a boxing match when I got back home. I started from the sign at Hastings past and moved south into the range. I hoped to see if I could find one or more of the herd of horses that inhabit the range, but I was a bit doubtful because of the high winds. 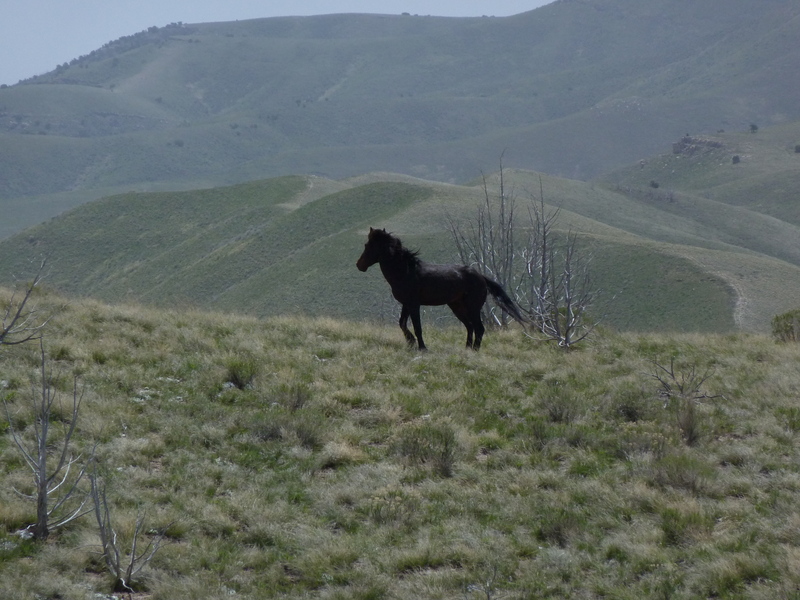 I did not think that I would find any horses so high on the ridgelines thinking that they would rather be sheltering in the secluded juniper hollows and drainages that flow steeply off either side of the range. So I had rather low expectations of seeing any sort of mammalian life. The meadowlarks were out in spite of the wind and I always enjoy their song on open range in springtime. The paintbrush has also started to bloom, along with other various low and tight growing wind resistant plants. These little gems contrast nicely with the dominant drab green-grey of saltbush and sagebrush. 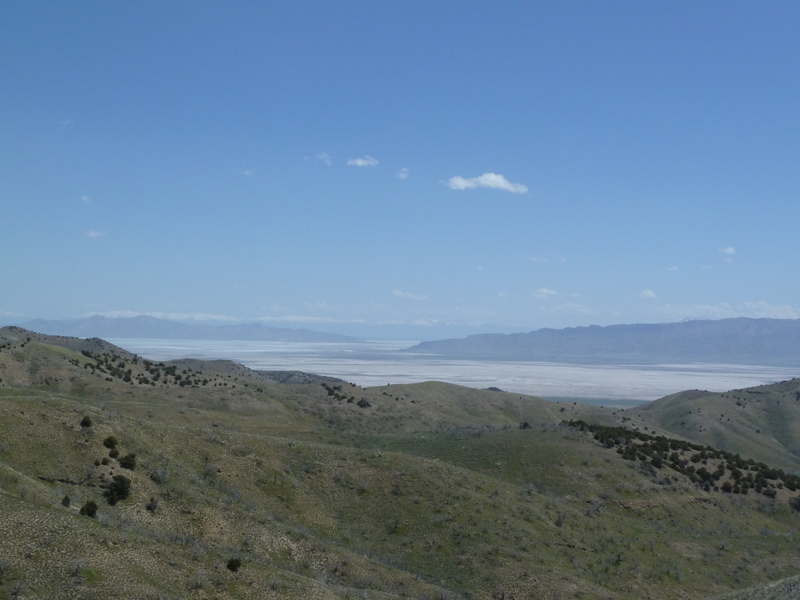 View of the Great Salt Lake - the Stansbury Range extends to the right and Antelope Island rises behind. Note the level of sediment left in the lakebed. The upper reaches of the central part of the range are not terribly difficult to hike on. For some portions there is a bit of a track crossing the high divide. Once I had reached a high enough point I could easily pick out Mt. Tabbys Peak – the highpoint on the range. Recent and frequent forest fires have burned much of the juniper (mistakenly identified as cedar by early western settlers) population, leaving skeletal remains to be bleached by the sun and blown by the wind. On such a windy day they created a slightly eery spectacle on the high ridges. Once I climbed to the main ridge, I immediately noticed the dust blowing in massive clouds out of the Bonneville Salt Flats to the west and Skull Valley to the east. This was a serious cloud of dust that eventually consumed all of the blue sky and swallowed the view of the higher Stansbury Range across the valley to the east. It was a Joad-like view. It was surprising to see given all the rain we have had lately. Apparently there has been much less precipitation west of Salt Lake City in recent weeks. I picked my way across the ridges, enjoying the views while they lasted and vaguely making for Tabbys Peak. I did not think I would achieve the summit. It is quite distant from Hastings Pass. 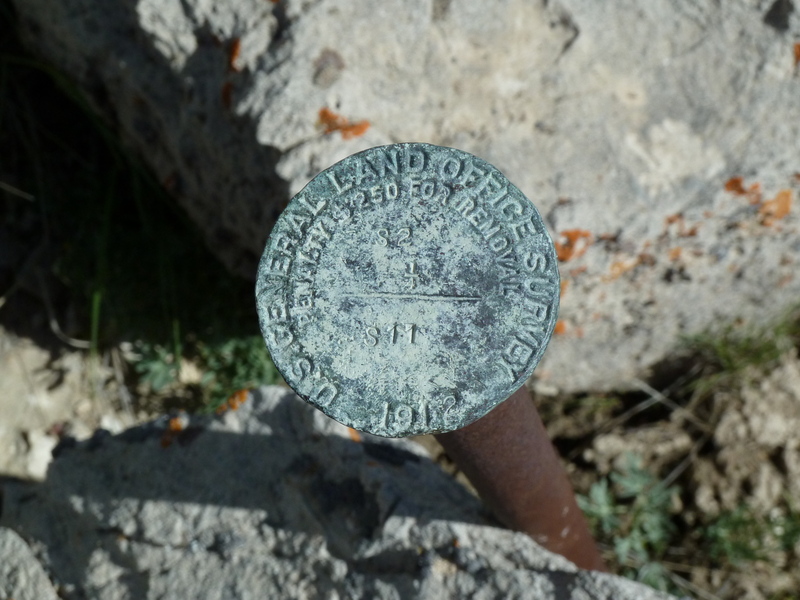 Several miles along, I came across an old General Land Office Survey benchmark which marked out township line S2 which I was able to locate on the USGS 1:100,000 map, but I am uncertain whether the benchmark is very accurate since it is not very secure. The benchmark itself is dated 1912. This is interesting since this region was not even thoroughly surveyed until just a century ago. I also wonder if this benchmark has much real utility these days. My guess is not really since no one much passes this way except for fools like me out for their Sunday dose of desolation. There are worse places to get a dose of desolation on a Sunday. Most of them have parking lots crammed full of the righteous SUVs of the greedy and selfish. As I crossed to the top of one of the drainages I spooked an unseen black horse. I believe it was a mare. She was a beautiful black and she stood for several moments looking at me curiously from the top of the next ridge. She seemed a little skittish and I did not want to panic her in any way. I do not think these horses generally charge humans (unlike moose or bison,) but I did not want to cause her undue stress. The hike back was uneventful. I took care to give the horse a wide berth as she was still grazing in the same spot I saw her on the way up. As I neared the end of the hike and the car came into view from the last ridge, I noticed that the BLM’s Hastings Pass sign which was directly behind the car was missing. I could not get a good view from about a mile or so, but as I got closer I realized that the sign had been blown over in the wind. This is a shame, since it looks to be a brand new sign, but it is evidence of just how strong the winds were on Sunday. 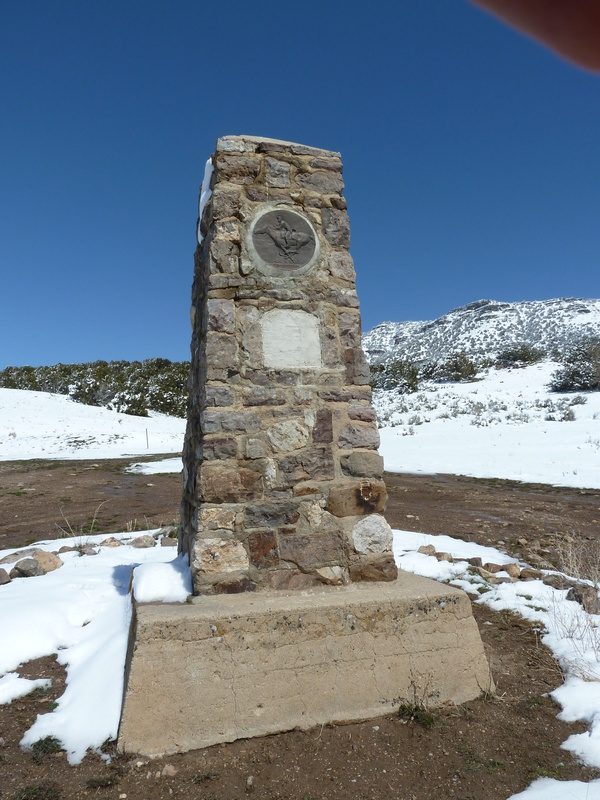 *OK, class, quick quiz…no googling or smart phones… who used this famous shortcut and ended up taking too long to cross the Great Basin only to arrive in the Sierra Nevadas after the onset of winter? And yes, your author is an unrepentant pedant. Mike and I took a trip down to the San Rafael Swell this past weekend. We both needed to get out of this rainy valley and enjoy some real sun. We were not at all disappointed. This was the first time I had ever been to the San Rafael Swell, but in some ways it is merely a geologic continuation of Capitol Reef. It rises out of the valley much the same way. The sandstone here is further up the geologic timescale. The Swell exposes layers from the Morrison, Curtis, and Entrada formation whereas the layers found in Waterpocket fold of Capitol Reef expose the geologically deeper layers of Navajo, Kayenta, and Wingate. The difference in stone is very noticeable, especially where the bluish Curtis layer is exposed. 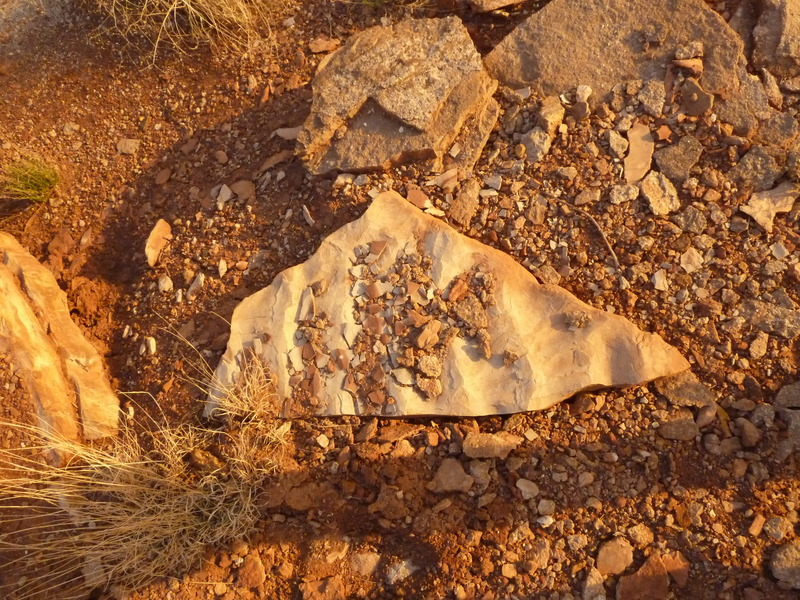 I also noticed a lot more fossilized ripples in these rocks than I tend to see in the Grand Staircase. Mike has been nursing a running injury so we decided to make this a much less strenuous trip. I still managed a good hike in Crack Canyon. It was a fairly non-strenuous slot canyon with a couple of nice little scrambles that took a little bit of skill to navigate. I am always surprised that it is much harder going down than coming up. Crack Canyon is one of the many…ahem… cracks in the east side of the San Rafael Swell where the water drains out of the uplifted and folded sandstone layers formed in a battlement against the dry flat wastes of the San Rafael Desert and the Green River valley to the east. It is amazing that over the eons since the Swell formed that water found its way through these cracks at all. I even noted a spot where a three to four foot slot had started to form where the water must obviously flow uphill slightly in order to punch through to the lower canyon. I read somewhere about backchannel flooding in canyon formation, and I think this could have plausibly happened along the eastern Swell buttresses. In wetter times, water flooding into the saturated Green River valley could have gathered in the backchannels and flooded the downriver side of the Swell’s canyons. This combined with water fighting from the inside to get out might explain why I was able to note this slight uphill flow location. Now strong flash floods coming down the canyon can still wash over this obstacle. Before I make any ridiculous claims I should consult a geolgist. Looking upcanyon - does the water flow uphill? Once out of the Swell proper Crack Canyon enters a meandering state as it crosses through buttes and buttresses of a much drier wasteland. I did not want to spend too much time hiking in this region as the heat of the day was coming up and I wanted to return to the relative cool of the Canyon’s narrow slots. I did notice some very pretty crystaline mineral layers in one of the cliffsides I crossed to shortcut a meander by means of a trail leading to a notch in the top of the butte formed by the turn in the stream. No trip to this side of the Swell would be complete without a visit to the Goblin Valley. I had been wanting to visit this area for quite some time and it was worth an afternoon of hiking. Upon arrival one is immediately bombarded by hordes of children playing hide-and-seek among the goblins but a short walk brings absolute solitude. Once again, the unofficial rule that most people do not wander more than five hundred yards from their cars in national parks and other protected areas is reinforced by the evidence. The valley itself is truly amazing. The softer layers of ancient Entrada mud are being slowly washed from between harder formed boulders of sandstone leaving uniquely absurd formations. There are also a few nicely placed hills, making it possible to climb and survey the entire landscape. The Henry Mountains appear on the southern horizon, there is the Swell to the immediate east and a couple of very absurdly placed bluffs in the midst of the wasteland on the way to the Green River. And here in the midst of these things is this valley populated by silent warp-eroded sentinels. I am sure that mine is not the first imagination to be blown by this “drôle de nature” and I am sure that there are other better masters of language who can do more poetic justice to this valley than my baseball-bat-blunt prose. As I walked among the goblins, I was taken mostly by the process involved in creating such a place. In a cosmic sense this place is completely unlikely. A shallow sea from a hundred million years ago laid down the sandstones, the bottom dropped out just at the edge of the valley and then millions more years of wet and dry cycles eroded the layers down to the forms we see now. And now, human children -whose intelligent existence is even more unlikely – play hide-and-seek among these figures. Odd. Nothing like a desert to move one’s cosmic sensibilities. The valley, like good art, has twisted perception. It changes the viewer’s understanding of what stone actually is and what it does. It should not bent naturally the way a human sculptor bends clay of the same substance. Here in this valley, passive natural forces did on a grand scale what human sculptors could only dream of doing. 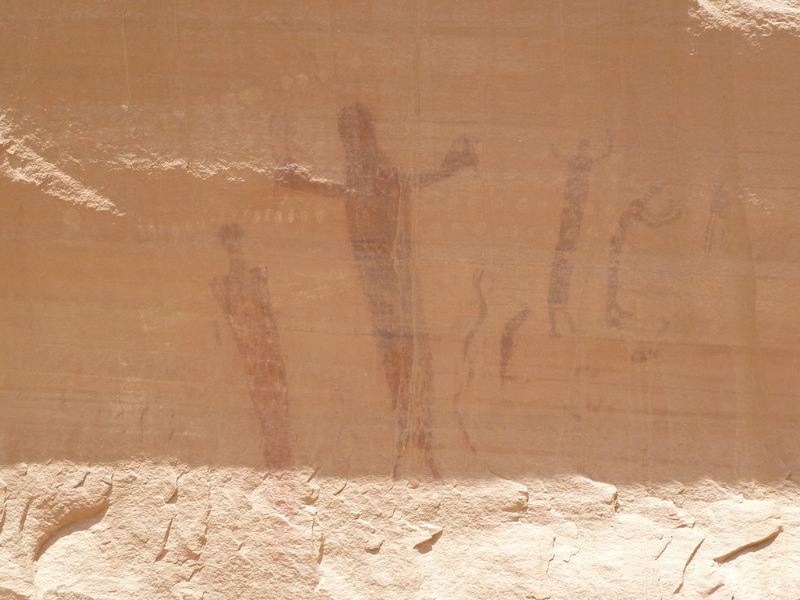 And speaking of human craft, on our way out of the Swell we managed to stop in Buckhorn Wash to see the famous rock art. I was disappointed to find out that it is literally on the side of the road. I expected at least a short hike. I was further disappointed to find out how badly it had been vandalized over the course of the last two centuries (for context, that’s less than 10% of the entire life of the paintings.) Apparently, Jim Bridger himself had no love of anything more cultural than his own prowess at scrawling his name across these once-sublime paintings. The before restoration picture shows his name plastered across the art. Such, as they say, is progress. I look forward to returning to the Swell to do a true scavenger hunt for some of its more hidden art. Northern Utah and the Wasatch Front have been experiencing extreme early spring drear. I was quite happy to get out of the house and into a canyon last weekend, but it was back to snow and cold all last week. We have had snow all the way to the floor of the Salt Lake/Jordan River Valley. Winter is keeping her cold frosty fingers wrapped tightly around this mountain town. This does perhaps have an upside – we have received our average annual precipitation for the water year (starting from October 2010.) This will make for a stunning wildflower season this summer. On the downside, heavy flooding is predicted once runoff is in full swing there might be some adverse consequences. I would like to see what the Jordan, Weber and Bear Rivers do to Great Salt Lake. After a week of such drear, I had to get out of the house and at least get some sunshine. Intrepid Mike and I decided to take a Sunday drive out to the West Desert along the old Pony Express route south of the Dugway Proving Ground. The clouds finally broke and we ended up having a rather nice day. The West Desert, especially in springtime, has nothing to do with what the term desert usually conjures up. 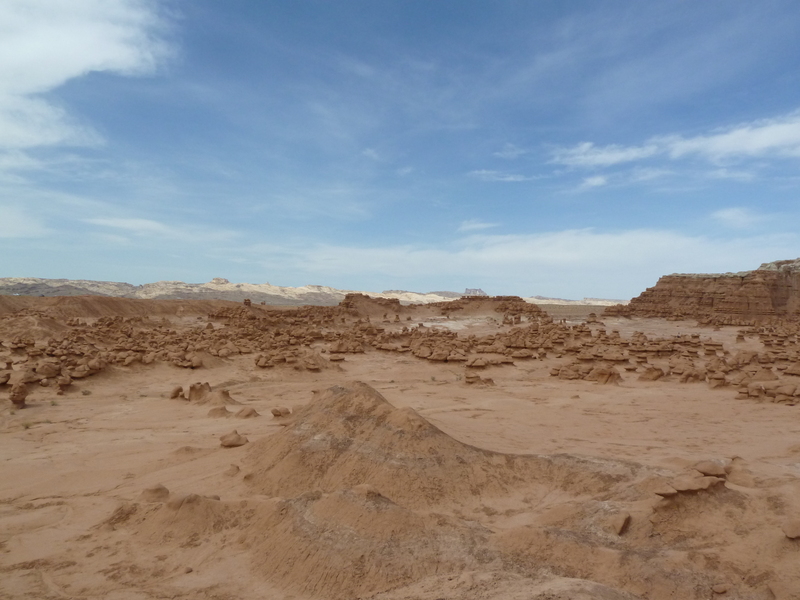 It is definitely a cold desert – for which this blog is named. This year it seems to be an especially cold desert. Snow still clings to the ranges and even fills some of the broad basins in between them. The drive over the Stansbury Range and down into the basin below Dugway proved uneventful. We drove on to Simpson Springs and enjoyed the view looking down into the broad basin and the ranges beyond from the preserved stone station house. From here, the road became were incredibly muddy since all of the snow is now running off of those ranges. There were several spots of incredible slop beyond Simpson Springs that blacked out the windshield to opaque as we drove through them. The Subaru held up quite well though and made it through the slop with no problems. The all wheel drive performed exquisitely. I speak now in positive tones about the fun, but these sort of rugged drives tend to test my patience. Once we got back to Tooele, we had to wash the car at the self-serve super-hose carwash. There are some excellent early season hiking/camping opportunities along the route. I believe that the campgrounds do not get much traffic except during hunting season and this part of Utah does not get the summer tour traffic that the south does. I look forward to returning to take advantage of the clear skies and broad basin topography for stargazing. With the ranges so distant, the horizons are comparatively low. Salt Lake City is also distant enough that there should only be low level light pollution. Most of the territory here is BLM land and there is some good cross country exploring to be done in the ranges before the weather heats up too much. If the snow remains, water will not even be much of a concern.